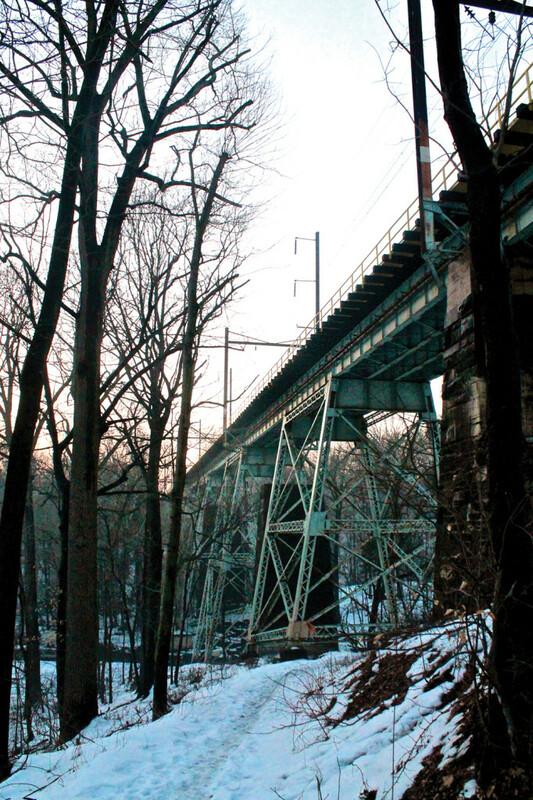 In just a few months, construction crews will close a portion of the Crum Woods for a multi-year project to replace the Crum Creek Viaduct, the 900-foot-long bridge that carries Media/Elwyn Line trains between Swarthmore and Wallingford stations, SEPTA officials said Wednesday at a public meeting at Swarthmore station. Several other construction projects are already underway to modernize and improve the aging rail line as a part of SEPTA’s “Rebuilding for the Future” infrastructure program, funded largely by a transportation bill signed by outgoing Pennsylvania Governor Tom Corbett in 2013. The current schedule has the construction running from early 2015 to early 2017. Train service on the line will not be affected until summer 2016, when the line will close from Swarthmore to its terminus at Elwyn for ten weeks. During that time trains will still run from Swarthmore station to Center City Philadelphia. The project’s contractor will close off the area of the Crum Woods beneath and around the viaduct in order to set up large cranes and other equipment, which will prevent runners and other users of the woods from crossing the train line. The contractor will also build temporary access roads and temporary creek crossings to use during construction. The stone formation known as “Crumhenge” will be dismantled and then rebuilt when the project is complete. By summer 2017, SEPTA plans to have the trails reopened and the site restored and landscaped according to the college’s master plan for the Crum Woods. Stormwater runoff from the new viaduct will be channeled into a new self-sustaining wetland area below. The Crum Creek Viaduct was built around 1895 to replace an earlier stone-and-timber viaduct on the same site whose support piers can still be seen under the tracks today. The current viaduct was last overhauled in the 1980s, and SEPTA considers it beyond its useful life. Weight restrictions have been imposed on trains that cross it, and a round of emergency repairs was made to it last year after inspectors found evidence of corrosion in some of the steel support elements. According to preliminary design documents, the new viaduct will look more like a highway bridge — with tall concrete supports carrying a steel-and-concrete deck — than a traditional train trestle. Construction crews will begin the project by building the new concrete supports beneath the existing viaduct. Then, during the summer 2016 service outage, they will replace the deck, including the tracks and the overhead electrification system that powers the trains. During that outage they will also replace the rest of the track and overhead wires between Swarthmore and Wallingford stations. Afterward they will remove the old steel supports, as well as the stone piers from the site’s original viaduct. Bids for the project from contractors are due the day before Thanksgiving, SEPTA officials said, and a winning bid will be selected soon after. A “notice to proceed” with the project will likely be issued to the contractor in early 2015. SEPTA officials said the current cost estimate for the project is $65 million, which is $12.5 million less than the estimate included in the agency’s 2015 capital budget. Prior to the passage of Corbett’s signature transportation bill, SEPTA had said that due to lack of funding it might have to shutter most of its regional rail lines, including the Media/Elwyn line, along with its eight trolley lines and several other elements of its system. The bill drew criticism from some conservatives for a gas tax hike it relies on for new funding, but was cheered by the Philadelphia region’s leaders and advocacy groups like the Economy League of Greater Philadelphia. Numerous transportation projects across the region and state have gotten underway in recent months as a result of the new funding program. In late October, the Pennsylvania Department of Transportation announced it was awarding an $899 million contract to replace and then maintain 558 aging highway bridges around the state. A $120 million project is now beginning to improve the Benjamin Franklin Parkway and the Vine Street Expressway below it in Center City. In Upper Darby, tens of millions of dollars in improvements are planned for the 69th Street Transportation Center, which serves four rail/trolley lines and many more bus routes. The transportation bill is expected to eventually generate and disburse roughly $2.5 billion per year, including almost $500 million for mass transit. SEPTA, which carries the majority of the state’s transit passengers, will receive most of that money. After the bill was passed, SEPTA introduced the “Rebuilding for the Future” program to address its backlog of capital projects. Instead of closing the Media/Elwyn line, SEPTA is now planning to extend it three miles west to a new terminus in Wawa, Pa., though officials said at the Wednesday meeting that acquiring land for that project is proving difficult. The Crum Creek viaduct is just one of several projects that the agency says are necessary to keep the line running. Others are already underway. Trains on the line have been replaced by shuttle buses every weekend since late September to allow crews to replace the timber and tracks and make other repairs on two of the the line’s other major viaducts, and crews have been working to replace the line’s 80-year-old overhead wiring. In addition, next year SEPTA will begin a $23 million project to replace Secane station, just a few stops from Swarthmore. In January, Corbett visited the station for a ceremonial groundbreaking on the parking expansion piece of the project. Thanks for a thorough and interesting report on this project!